Hashimoto Shinzaemon (橋本新左衛門) was born in Takagise-cho, saga, Hizen (肥前) in 1572 to Hashimoto Michihiro (橋本道弘) who was the son of Hashimoto Kuranojo Morihiro (橋本盛弘). Both his father and grandfather served the Ryuzoji Takanobu daimyo family, who was then the ruler of Saga. In 1584, his grandfather lost his life in the battle of Shimabara and his father died not long after of illness. His lord, Takanobu was also killed around this time at the hands of the Shimazu of Satsuma. This left the then thirteen-year-old Shinzaemon (左衛門) an orphan. Since he was too young at the time to succeed to the head of the Hashimoto family, he had to abandon his right of inheritance and the pedigree was terminated. The young Shinzaemon (左衛門) went to live with his relatives who were making swords in the near-by town of Nagase. It is thought that one of these relatives was Iyo (no) Jo Munetsugu (伊予の掾宗次) where he made himself an apprentice. There is also a possibility that he spent some time apprenticing with the Dotanuki School of Higo province. Around this time, the foreign trade through Nagasaki was declining but Lord Nabeshima Naoshige, ruler of Hizen, was establishing a developing business empire in the thriving city of Saga. In 1596, when Tadayoshi, (he was then still called Shinzaemon (左衛門)), was twenty-five years old, he was sent by the Nabeshima Daimyo to study under Umetada Myoju (埋忠明寿) in Kyoto. Umetada (埋忠) was an established and respected sword smith who went on to become known as the founder of the Shinto School of sword making. Accompanying Tadayoshi (忠吉) was his cousin, Munenaga (宗長). Munenaga (宗長) later became one of Tadayoshi’s best horimonoshi. Umetada (埋忠) gave Shinzaemon (左衛門) the name “Tada” (忠) and after three years of study, he returned to Nagase-Mura, Hizen as Tadayoshi (忠吉). Then following the orders of Nabeshima Katsushige, he left Nagase-Mura and relocated the whole school to the castle town surrounding Saga castle. Perhaps this is a good point to interject what social changes were going on then in Japanese history as far as sword manufacture is concerned. During the Koto period the centers of sword manufacture tended to be in places controlled by powerful clans or religious institutions. They had local production of quality sand iron to be used as raw material in the sword making process. With the advent of the Azuchi/Momoyama Era of Oda Nobunaga and Toyotomi Hideyoshi, and most importantly, the long period of peace brought about by the Tokugawa Bakufu during the Edo Era, the power distribution within the nation changed dramatically. The large temples and shrines were deprived of their right to maintain their own armies. Instead, the Daimyo were endowed with authority from the central government to govern certain localities as feudal lords in communities surrounding a castle. Thus Jo-ka Machi or “Castle Towns” came into being. For the first time in history, these castle towns together with such great cities as Edo, Kyoto, and Osaka became the centers of sword manufacture. The Hizen School of sword making (generally known as the Tadayoshi School) was a flourishing industry that was a valuable earner of currency for the Nabeshima clan. 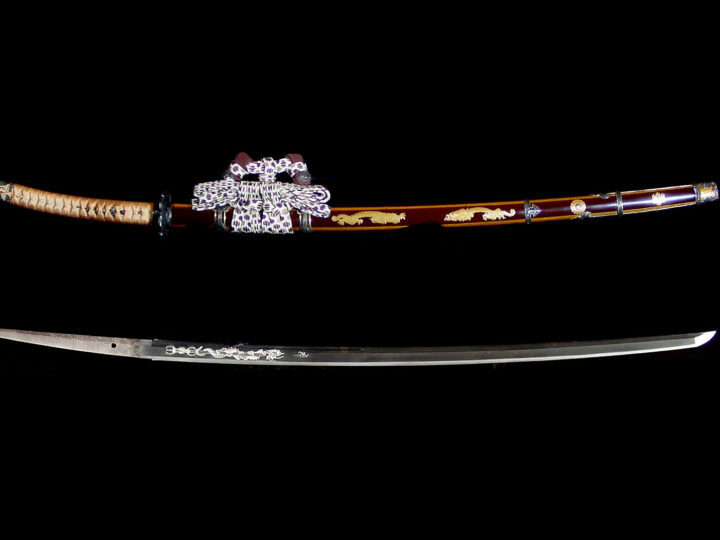 This was a result of the efforts expended by the Hizen Daimyo to place a priority on the promotion and development of the sword and ceramics (Imari-yaki, Nabeshima-yaki, Arita-yaki) industries. The Nabeshima Daimyo realized that a solid economic base would be necessary if they were to recover the huge amounts of funds they were forced to expend on Toyotomi Hideyoshi’s failed Korean invasions in which they played a major role. Based upon the generous patronage of the Nabeshima family, the Tadayoshi smiths devoted themselves to the industry of sword forging. Tadayoshi’s earliest dated works are dated in the eighth month of the fifth year of Keicho or 1600. In the tenth year of Genna, Tadayoshi (忠吉) went to Kyoto again, and in the second month of that same year, he was given the title of Musashi Daijo (武蔵大掾). At that time he changed his art name to Tadahiro (忠廣). He also gained the privilege to use the prestigious traditional family name of Fujiwara. He used it on all his swords after that time. SUGATA: He made mostly shinogi-zukuri katana of 66.7-69.7 cm. followed by wakizashi and then tanto. Among his hira-zukuri works there are more wakizashi than tanto. There are some katana and wakizashi in kanmuri-otoshi style. Most of his wakizashi are shinogi-zukuri in shape. 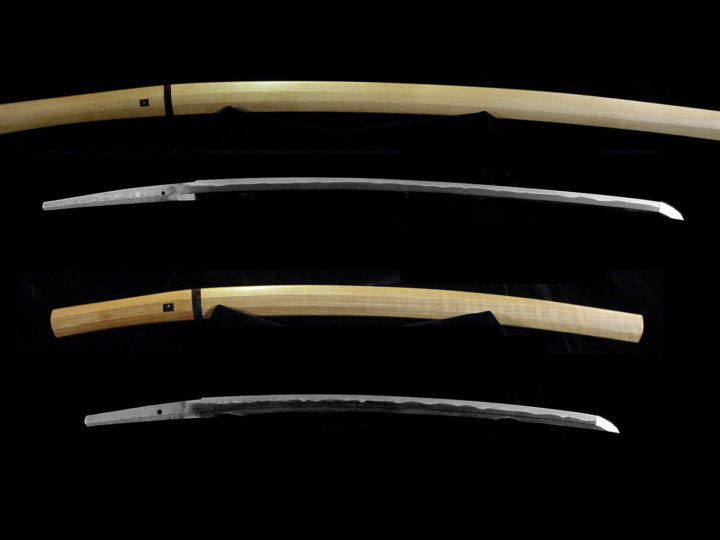 During his “Junin” days he made wakizashi in the shobu-zukuri style. Also, probably because of the influence of his teacher, Umetada, one can occasionally find the katakiriba style. 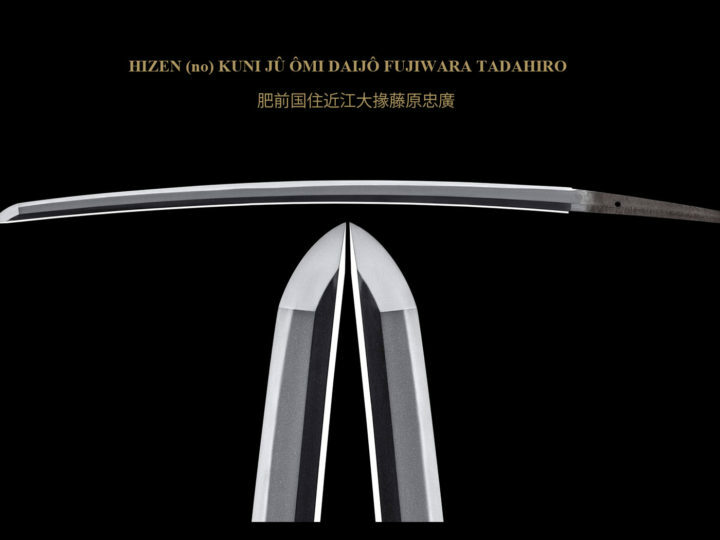 Hizen swords are said to have the most “stylish” shape of all Shinto swords and the Shodai Tadayoshi’s works are considered the most stylish of all. There are quite a few naginata and yari as well among his works. JITETSU: It is extremely fine and tight. It is comprised of a dense ko-mokume hada, which is known as konuka-hada. It should be noted, however, that the early works of Shodai Tadayoshi had a coarse, unrefined Koto style hada called Hizen tetsu (blackish steel with ko-mokume hada typical of Koto work). His early works contained a mixture of coarse itame with mokume with some masame hada also present. The jigane of this period sometimes contains jifu and the ji-nie is powerful and forms outstanding chikei. During this period it is thought that he was trying to copy the works of such smiths as Shizu Kaneuji and Chogi. After the end of the period we call his “shugin Mei” period (after Keicho 14) his hada became a tight ko-mokume and ko-itame that we know as konuka hada. HAMON: As stated, Tadayoshi initially copied some of the other master’s works, i.e. 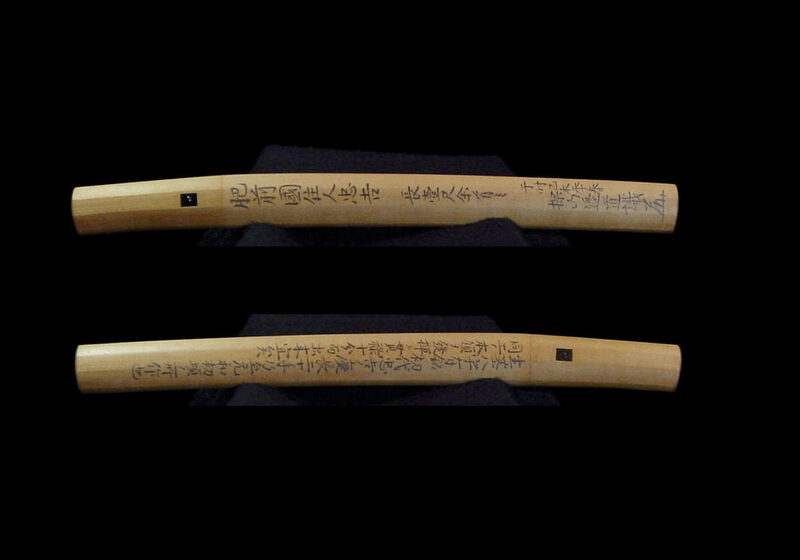 Shizu Kaneuji, Bizen Chogi, Rai Kunimitsu, Yamato-mono, and others. He is best known for his chu-suguha hotsure with deep ko-nie and ashi. From the edge to the mid-point of the hamon, the nie and nioi are worked together giving the hamon a subdued whitish color. He also made chu-suguha notare with four or five gentle notare along the length of the blade, choji midare, omidare, and notare-midare. Note that there is tobiyaki in the midareba of all Hizen swords. BÔSHI: Generally, ko-maru with much nie, which turns into a Hizen bôshi (yakiba width at the yokote is even throughout the bôshi at the fukura). His gunome swords, however, have a gently undulating ko-maru bôshi, sometimes with the irregularity continuing in the bôshi with a long kaeri. Tanto are ko-maru with a graceful kaeri. HORIMONO: Umetada Myoju, Munenaga, or Yoshinaga made all the horimono for the Shodai Tadayoshi. Bo-hi and futatsu-hi are rare. The name of the horimonoshi often appears in a soe-mei. 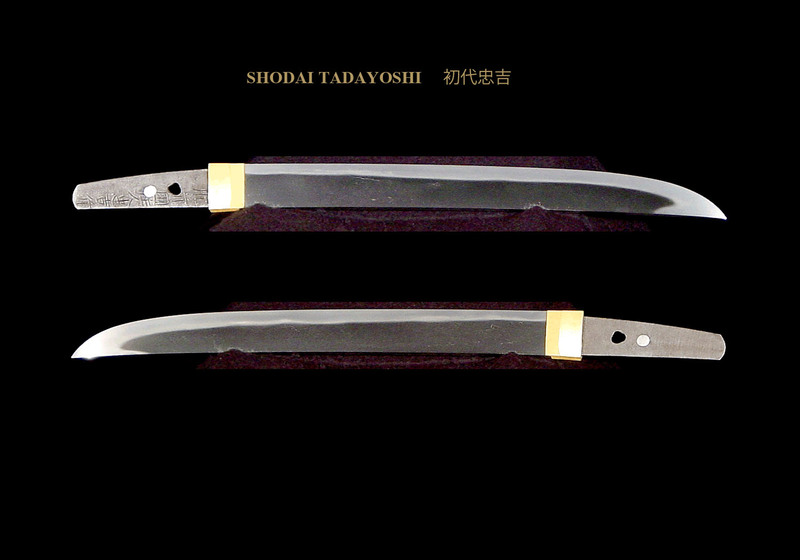 It should be noted that when the Shodai Tadayoshi added horimono to his blades he customarily put the more elaborate horimono on the side that he signed. In the case of his katana, this is the ura or tachi-mei side of the blade. 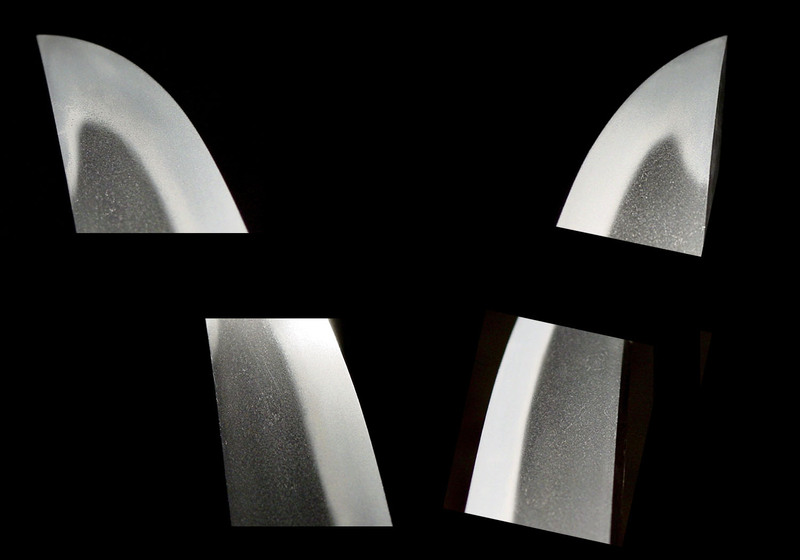 Of course, when the horimono is present on only one side of the blade, the mei is put on that same side. This is an important kantei point for Hizen blades. NAKAGO: Tadayoshi’s nakago were relatively short during his “Go-ji” Tadayoshi period, but during his “Junin” Tadayoshi period he made some long ones. 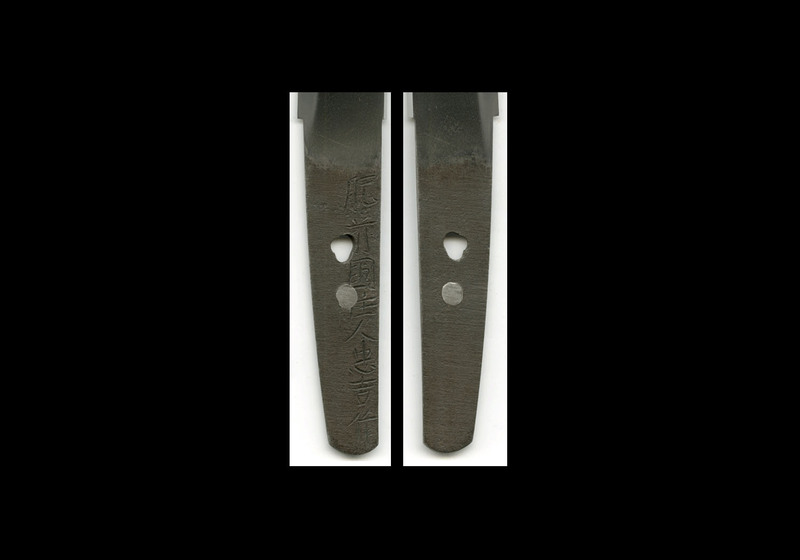 The nakago mune on almost all his blades with be slightly rounded, whereas later generations had flat edges on wakizashi and tanto. His nakago jiri will be mostly kurijiri and yasurimei will be mostly katte-sagari, but kiri yasurimei will be found during his “Junin” period. MEI: A few of his works are dated. 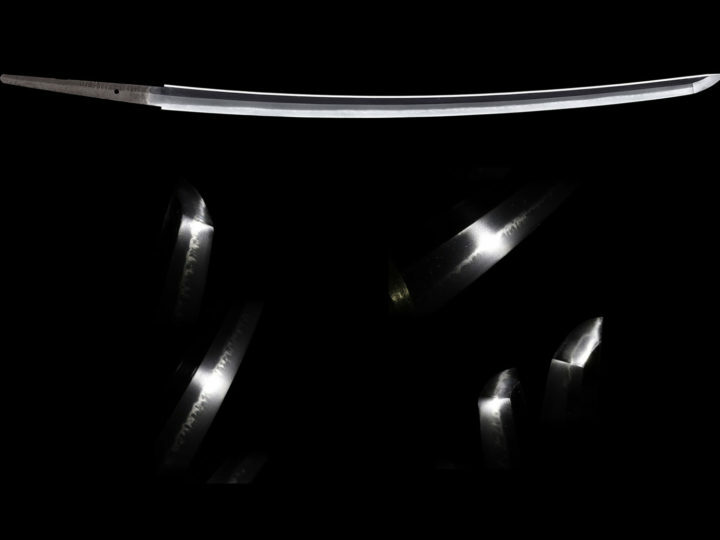 The mei is always given on the reverse (ura) in katana and on the obverse near the mune on wakizashi and tanto. When his mei is given in five characters, it is called his “Goji mei”. Between Keicho 5 and Keicho 14 his mei characters have a graceful and unique style called his “Shugan mei”. This name comes from the writing style of the Priest of the same name who had a strong influence on Tadayoshi. Starting around Keicho 18 most of Tadayoshi’s mei consist of eight characters containing “Junin”. This is called his “Junin” period. His signatures are listed below.